Wanda Gag. MILLIONS OF CATS. Coward, McCann & Geoghegan. New York, 1928. '...The hand-lettered text tells the story of an elderly couple who realize that they are very lonely. The wife wants a cat to love, so her husband sets off in search of a beautiful one to bring home to her. 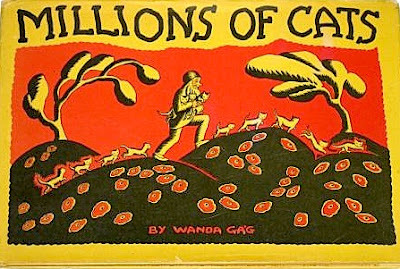 After traveling far away from home, he finds a hillside covered in "...hundreds of cats, thousands of cats, millions and billions and trillions of cats..." This rhythmic phrase is repeated several other times throughout the story. The man wants to bring home the most beautiful of all the cats, but he's unable to decide. Each seems lovely, so he walks back home with all of the cats following him. His wife is dismayed when he arrives, realizing immediately what her husband overlooked: they won't be able to feed and care for billions and trillions of cats. The wife suggests letting the cats decide which one should stay with them, asking "Which one of you is the prettiest?" This question incites an enormous catfight, frightening the old man and woman so that they ran back into the house. Soon, all is quiet outside. When they venture out, there is no sign of the cats: they'd apparently eaten each other up in their jealous fury. Then, the old man notices one skinny cat hiding in a patch of tall grass. It had survived because it didn't consider itself pretty, so the other cats hadn't attacked it. There are many copies around and dealers charging betewwen $100 and $2000 for what appear to be the same book. The true first should have 'PUBLISHED IN NEW YORK by COWARD-McCANN, Inc. IN THE YEAR 1928' on the title page and "Printed in USA by the Jersey City Printing Co." on the copyright page. This printing info is absent from later editions. The d/w comes in 2 states - the back of the dust jacket (yellow) is blank on the first printing and on second state copies the back has a one paragraph biography on Wanda Gag, followed by an endorsement of Millions Of Cats by Rockwell Kent. This is followed by a one paragraph review of the book by Anne Carroll Moore. Thanks to the authoritative Childrens Picturebook Collecting site for this. VALUE? Auction records show a signed limited edition (250 copies) with an etching and in slip-case (not issued in jacket) making $1650 at Swann in New York April 1999. This would probably make twice that now. As we speak a copy of the 1928 in second state jacket awaits a bid on ebay at a highly ambitious $2899. Surrounded by superlatives it is in fact an ordinary copy lacking the fep (mentioned as if it is no big deal) and the info that 'Collector sites value this wonderful antique collectible children's book in Very Good condition at $4,000+ !!' 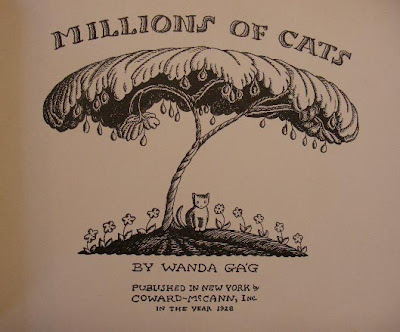 Meanwhile a copy in a chipped jacket made $800 in Baltimore in 2006 and back in 1983 at Waverly someone paid $65 for a copy inscribed by Wanda who had thoughtfully added a drawing of a cat. A decent but not fine first/first in jacket can be found on ABE at $1750 and another possibly later state at $200. A difficult book, desirable in superior condition- a fresh copy in a sharp first state jacket might be enough to make a cat laugh. What would a limited edition without etching and slip case in poor condition be worth?